We spent a long weekend in Mexico City at the end of May. 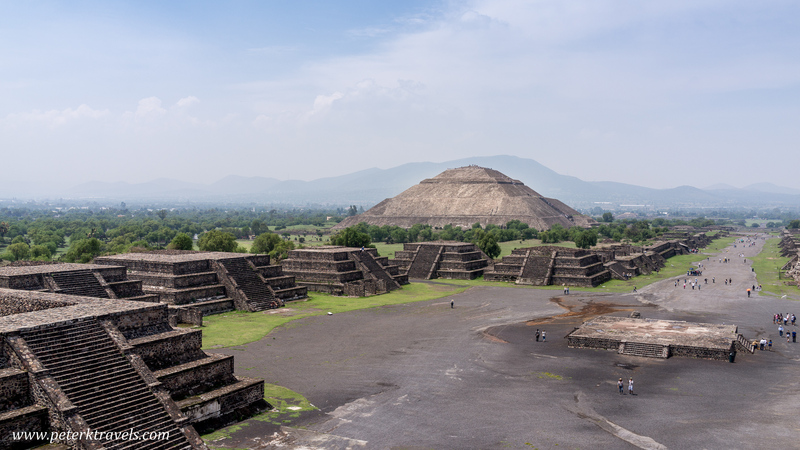 I really wanted to take a trip out to Teotihuacan, and climb the pyramids there. The site is located about 30 miles northeast of Mexico City, and the plan was to travel via public transportation. 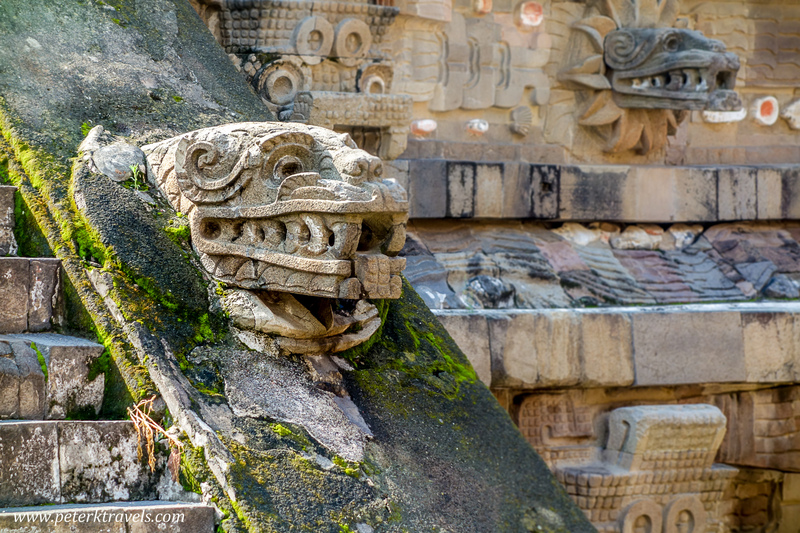 The city is thought to have been started around 100 BC. 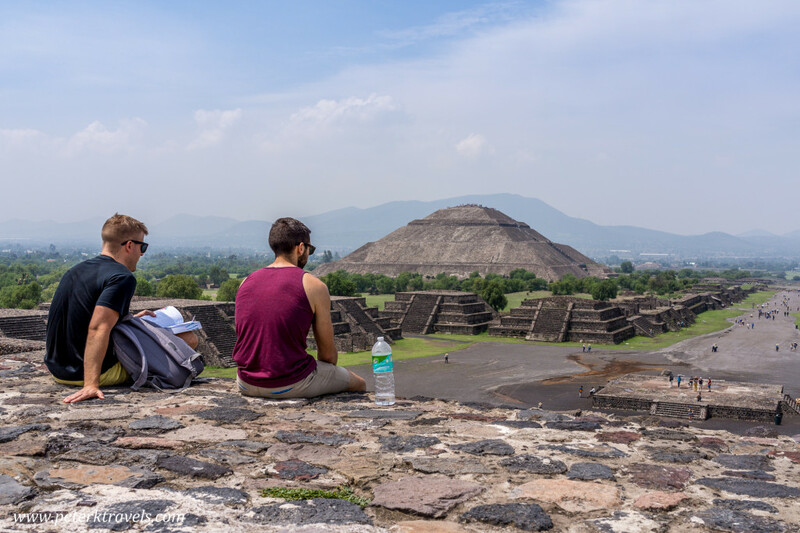 At its height, around 450 AD, Teotihuacan was the largest city in the pre-Columbian Americas, with a population estimated at 125,000 or more. I hadn’t used the Mexico City Metro before. Armed with a map, we descended into the bowels of the city and purchased tickets — only 5 pesos (about $.30 US) each. We started at the Zocalo station, on the blue line. You pick the direction based on the last stop on the line — in our case, we headed toward Cuatro Camiones. We passed the Allende and Bellas Artes stops, then transferred to the green line at the Hidalgo station, this time headed towards Indios Verdes. 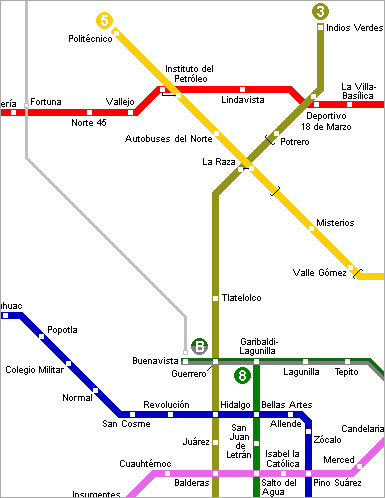 We only stayed on the green line for two stops, getting off at La Raza, and boarding the yellow line towards Politecnico. Finally, we reached our destination — Autobuses del Norte. While this seems relatively complicated, it was quite easy and went very fast. At the Autobuses del Norte station, we walked to Gate 8, where buses were leaving for Teotihuacan. A round trip ticket was $92 pesos (about $5 US). Fortunately, a bus was leaving in about 10 minutes. We purchased tickets, and headed to the gate. The bus was quite nice, no restroom, but it was a relatively short ride (around 1 hr) until we arrived at Gate 1 of Teotihuacan. A short walk brought us to the entry booth, where we paid the roughly $4 US entry fee. Gate 1 is the southernmost, at the bottom of the site. This meant we’d walk up the Avenue of the Dead and get to see pretty much everything along the way. 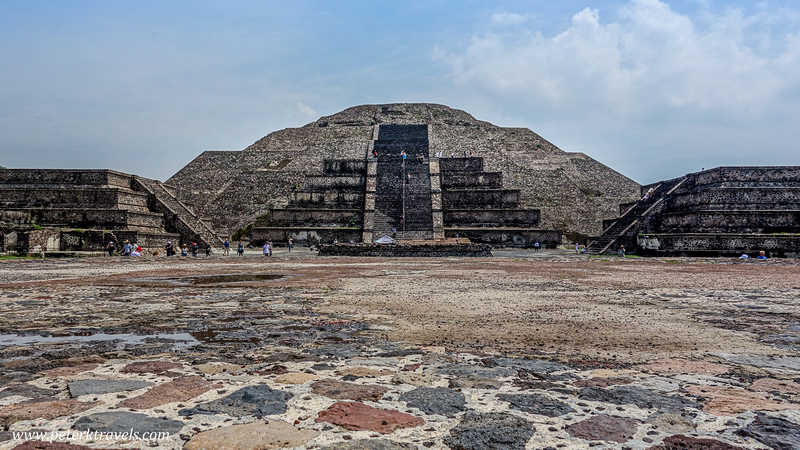 This does mean up to a mile of walking — so if you don’t wish to walk, you could enter the site at Gate 2 or 3 to see the main pyramids, skipping the smaller Temple of Quetzalcoatl (Feathered Serpent) which is near Gate 1. 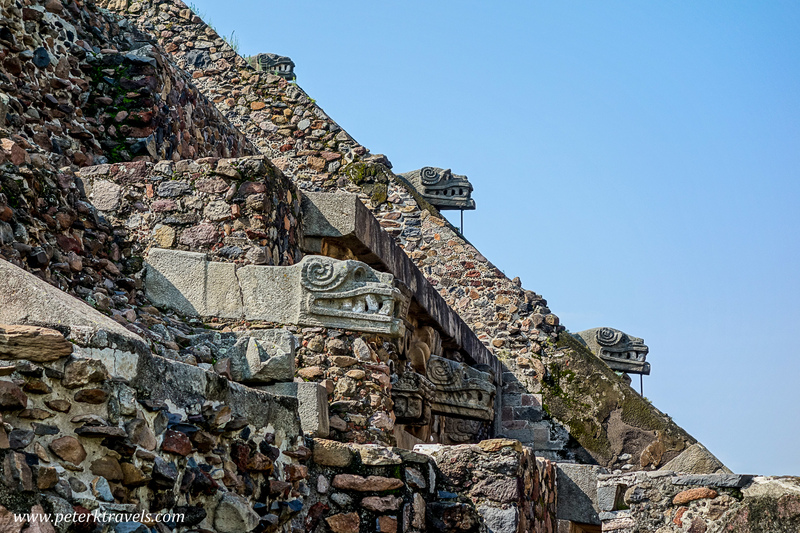 Temple of the Feathered Serpent, Teotihuacan. 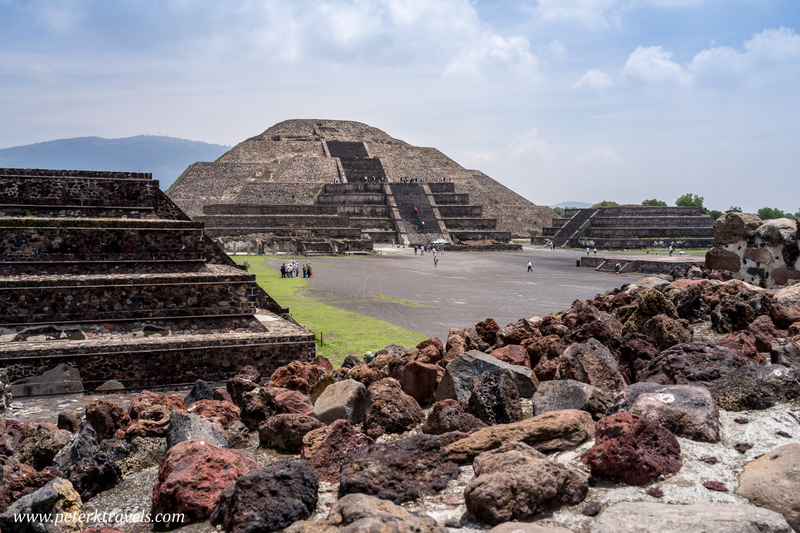 The Pyramid of the Sun is the largest building at Teotihuacan, and is 220 feet tall. It’s often claimed to be the third largest pyramid in the world — whether by volume or height, it’s unclear. Either way, it’s a massive structure. The photo below is three images stitched together — the entire pyramid wouldn’t fit in my camera viewfinder without stepping too far back. 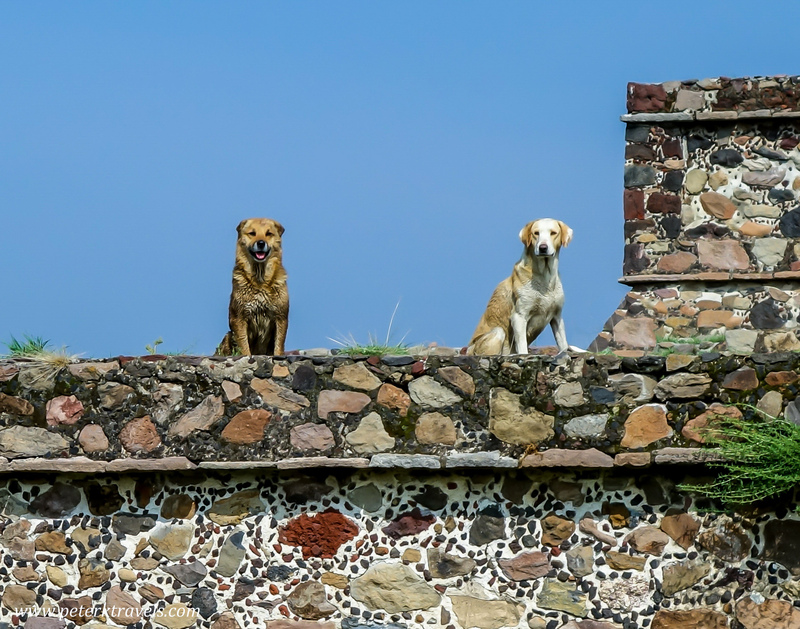 Pyramid of the Sun, Teotihuacan. 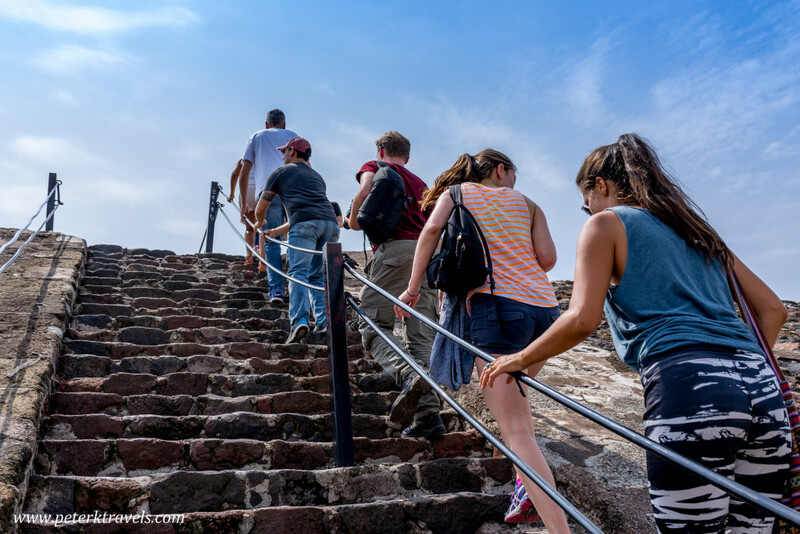 Climbing the Pyramid of the Sun was straightforward — there are steps, and a handrail you can hold onto. The steps are large, and there are apparently 248 of them. But, it went quite quickly. 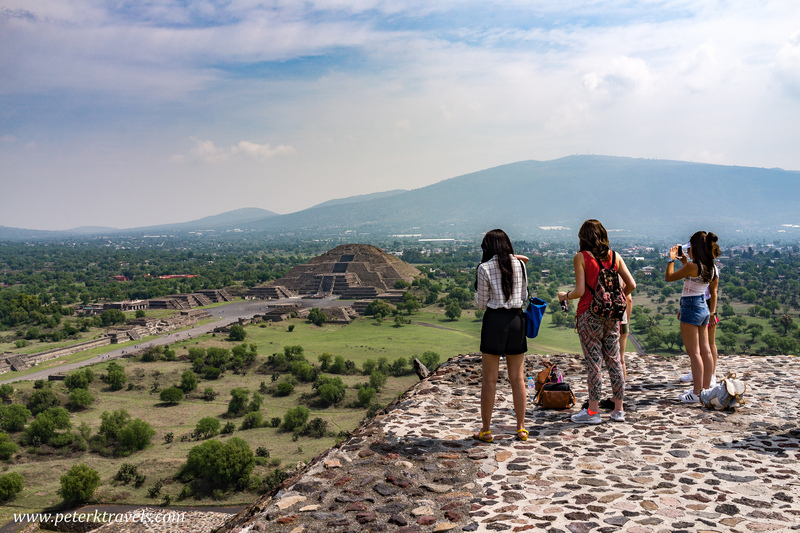 Teotihuacan is at nearly 7,500 feet of altitude, so if you aren’t used that, take breaks by stopping along the way. 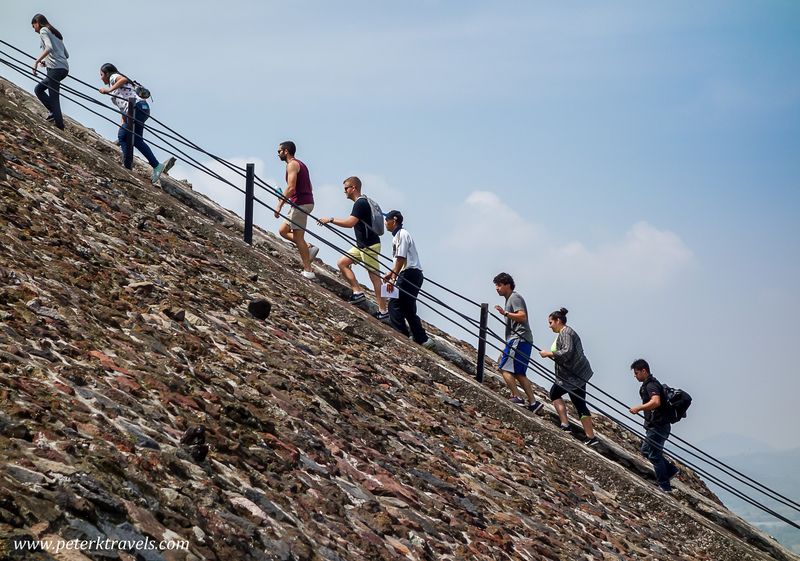 Climbing the Pyramid of the Sun, Teotihuacan. 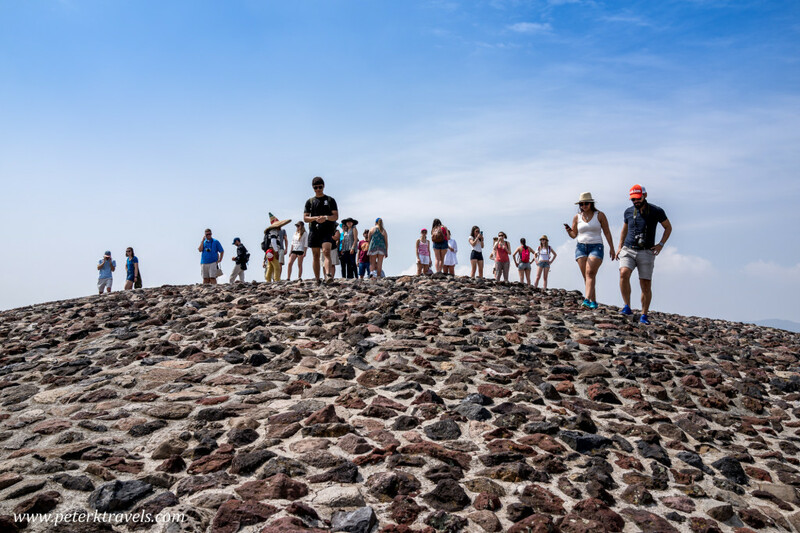 Tourists atop the Pyramid of the Sun, Teotihuacan. 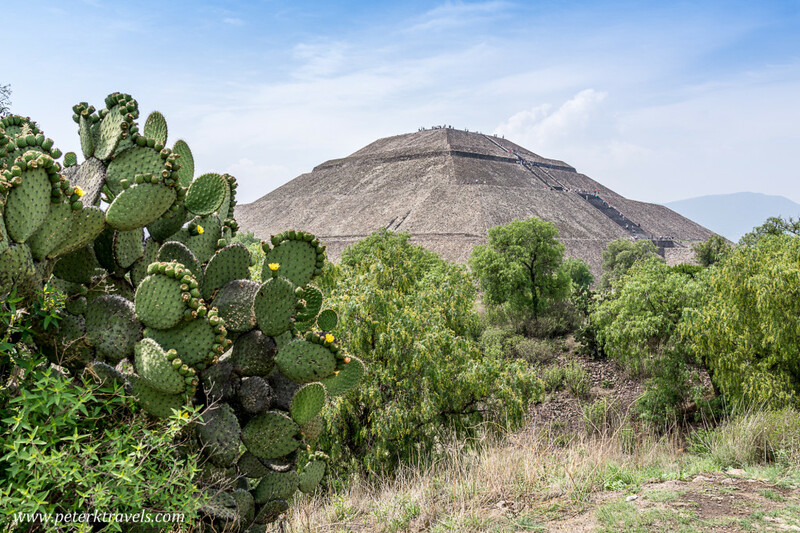 There are also multiple levels of the Pyramid of the Sun, so you can stop and walk around before continuing up. These were excellent places to take photos of the site. Pyramid of the Moon photo from Pyramid of the Sun, Teotihuacan. 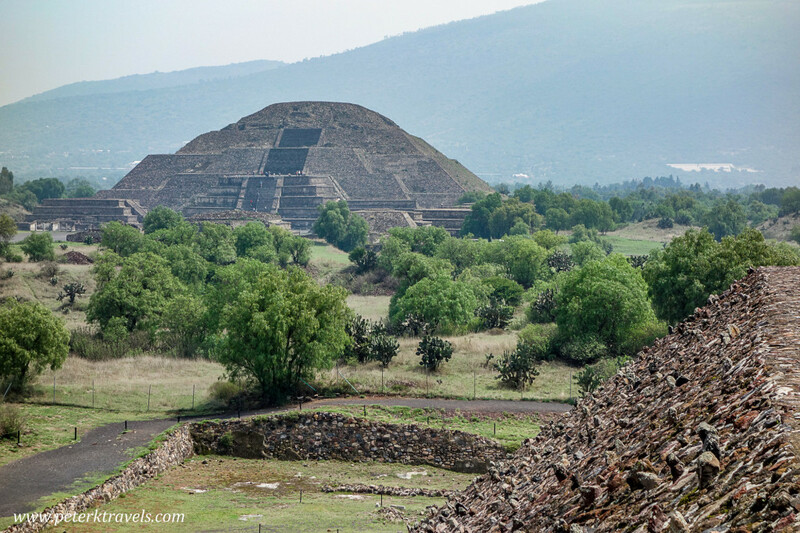 After climbing down, we continued down the Avenue of the Dead toward the Pyramid of the Moon. 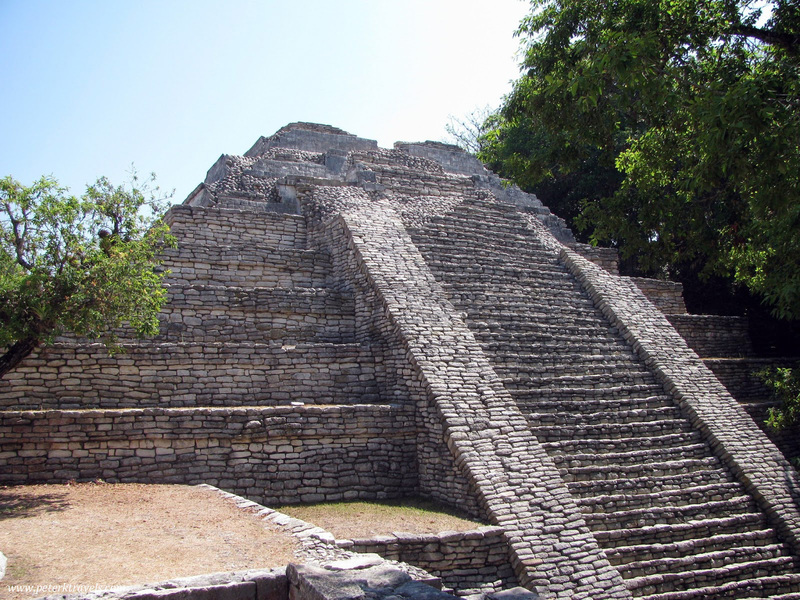 There are other smaller structures along the way which can be climbed to give nice views of the pyramids. The last pyramid on our journey was the Pyramid of the Moon. 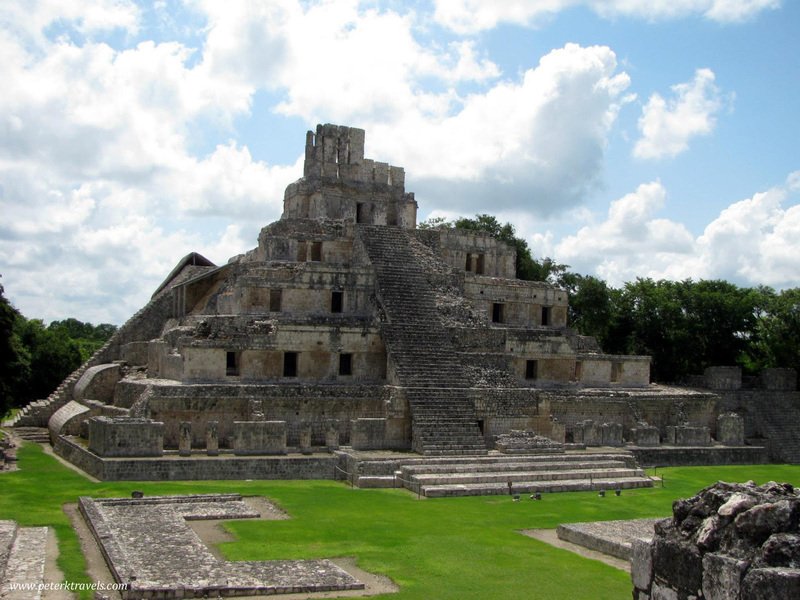 At about 140 feet tall, it’s not nearly as large as the Pyramid of the Sun. You can’t climb all the way to the top, but it’s still worth climbing. 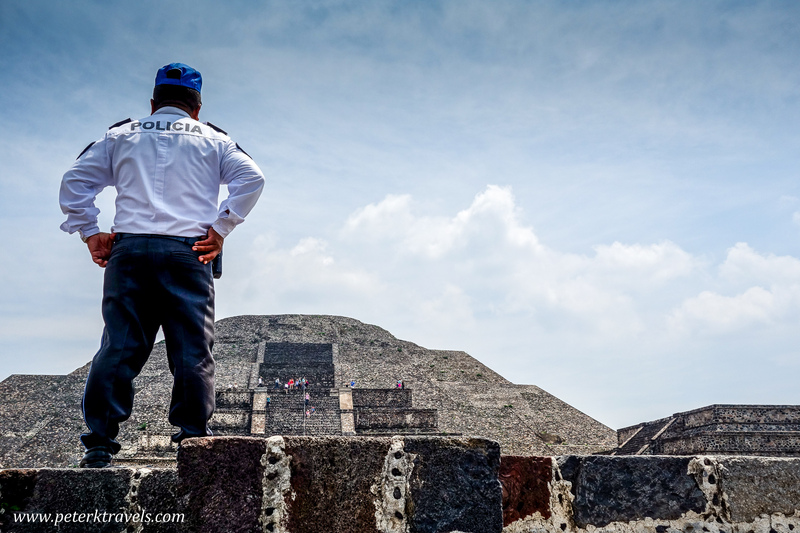 Pyramid of the Moon, Teotihuacan. View of Pyramid of the Sun from Pyramid of the Moon, Teotihuacan. 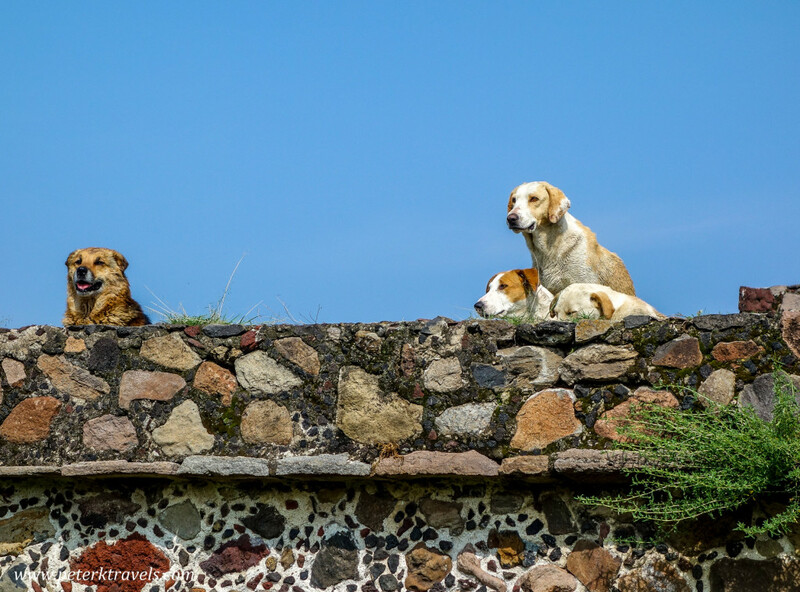 Guarding the Pyramid of the Moon, Teotihuacan. 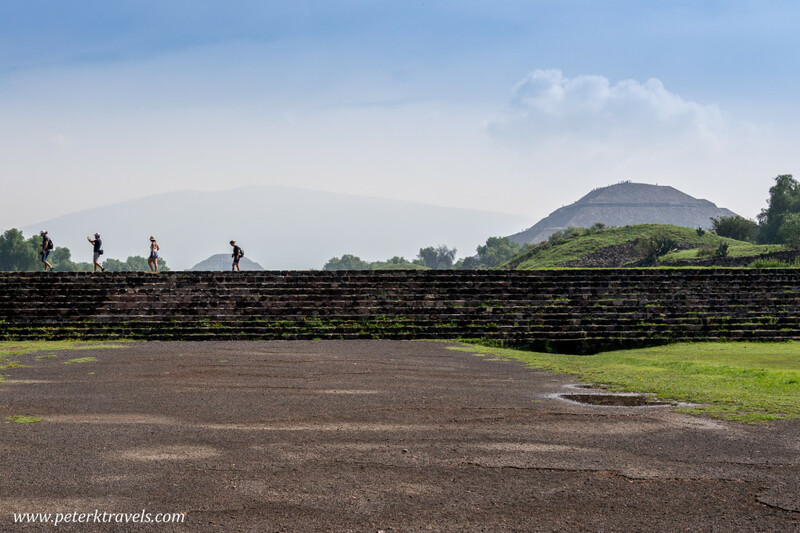 When were ready to leave, we exited at Gate 3, near the Pyramid of the Moon. A short walk to the road found a bus waiting headed back to Mexico City. 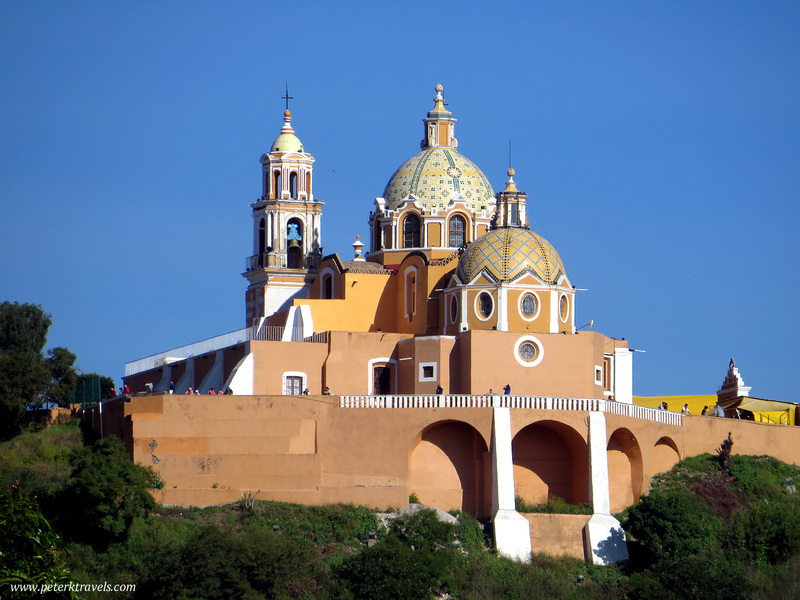 We simply reversed what we had done before, arriving back at the Zocalo. 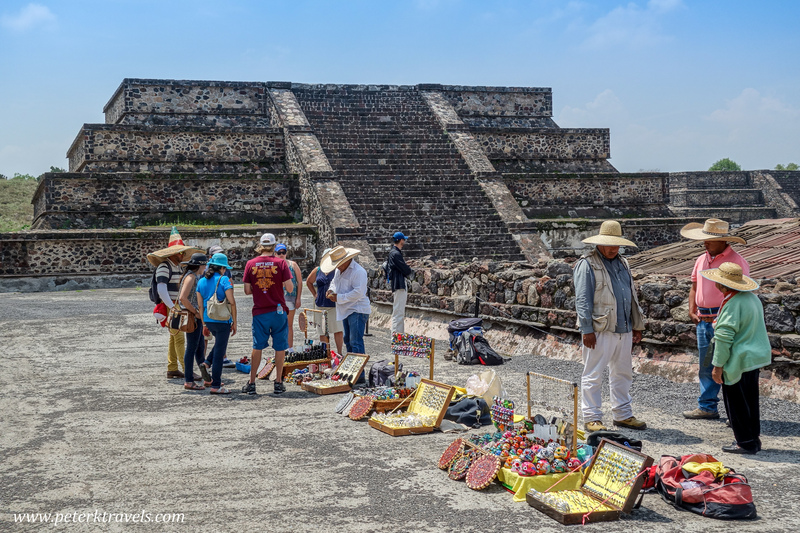 When heading to Teotihuacan, take sunscreen, water, and a hat — it’s hot and sunny, and there is little shade. There are lots of vendors around, mostly selling jaguar whistles and jewelry. They can be quite persistent! Teotihuacan was very impressive. 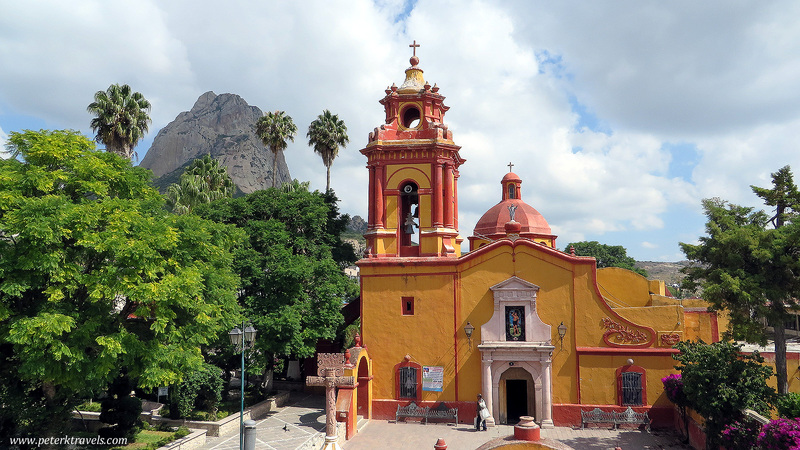 I feel it’s in that “can’t miss” category — so if you are near Mexico City, check it out!